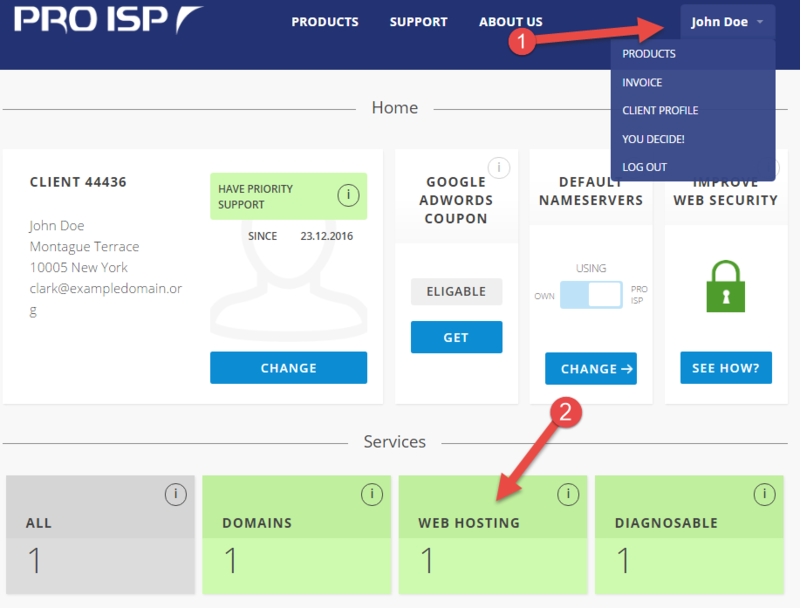 This guide shows how to easily migrate the contents of a web hosting account/email from a different supplier to PRO ISP by using Migration Assistant. The Migration Assistant is our automatic help for transferring content to your web hosting account at PRO ISP. 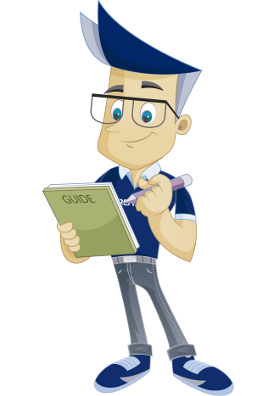 This guide assumes that you have already logged in to the customer portal with your customer number. Click on your name in the menu. Choose "Web hosting" as shown in the screenshot below. Find the web hosting account you want to migrate content to in the list, and choose "Migration Assistant". You can choose to move one or more of these. What you do not want to move, you leave empty. Below you can see a summary of the alternatives and the fields for each alternative. Only email addresses that support IMAP can be moved. To add more email addresses, you can click on "+ Add email address". Email Type the email address you want to move. Be aware that this will be moved to an identical email address on your web hosting account with PRO ISP. Password Type the associated password. If you have created the email address on your web hosting account with PRO ISP, it must have the same password. Server Type host name for the server where the email is stored. This is the same as the incoming email server in your email client. Port Type IMAP port to the server mentioned above. Port 143 is standard port for IMAP and will work in most cases. If it doesn't work you should type the port that is set in your email client. Create the email address automatically on your account with us If you haven't created the email address you can tick this choice so that the email address is automatically created with the same password for you. Firewall on the server that is being imported from must be open on specified port. Our server's IP or host name must have access to the database and must therefore have been added to the list of IPs/host name that has access in MySQL (unless all IPs have access as the standard setting). To add more databases you click on "+ Add MySQL database". Username Name of the database user that has access to the database. Database name Name of the database that is being moved. Server Type host name for the server the MySQL database is located. Port Type MySQL port to the server mentioned above. Port 3306 is the standard port for MySQL and will work in most cases. Flyttehjelpen will automatically create a database and associated database user with access to the database. Files on the web hosting account will be searched for username, database name and associated password, and will be replaced with the automatically created equivalent values. To be able to move files/folders over, FTP access to these is required. The files/folders are moved automatically to the public_html folder on your web hosting account with us. Username Name of the FTP user who has access to the files/folders. Server Type host name for the FTP server. Port Type FTP port for the server mentioned above. Port 21 is standard port for FTP and will work in most cases. FTP path to website Relative path to where files/folders are located. This often differs from full path. If you are unsure you can ask your current supplier about this. Full path to website Full server path to where files/folders are located. If you don't know this you can ask your current supplier. Delete content in public_html on your account with us If you have added content to the public_html folder already, but do not want to keep this, you can tick this box to delete it automatically for you before the contents from your previous supplier is moved. When you have specified the information you want on the page, you can click on the "Move" button at the bottom of the page. All data has now been saved in our system and the moving will start as soon as possible. Normally that means that the moving starts within 5 minutes after you added it. How long the moving takes depends on how much data is being moved. You should expect at least 5 minutes per email address, 10 minutes for moving of files/folders via FTP and 10 minutes for each database. 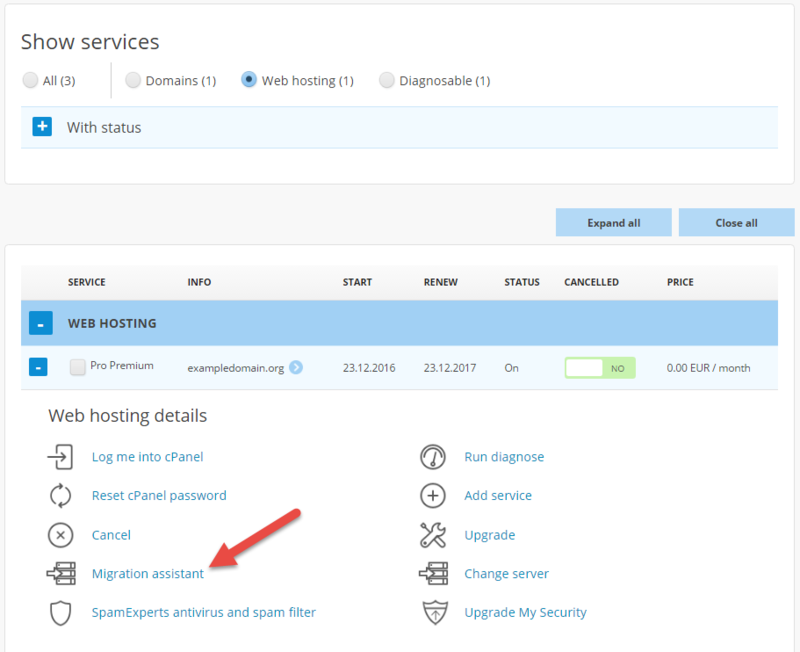 To check the status and see logs of the migration, you repeat step 1 and 2 in this guide. After that you choose "Overview over current and previous migrations". We have now been through how to easily set up automatic migration of content from your previous supplier to PRO ISP by using Migration Assistant.